Most people think that the lean-to house was the earliest house form on island, but it wasn’t. The lean-to house is easy to spot—having a full two-story façade, or front elevation, and a one-story rear elevation connected by a long sloping north roof (called a catslide), and a single massive chimney. Nantucket’s earliest house styles, known as English or Medieval, often evolved into lean-to houses by the addition of a one-story wing. The leanto, like other early house forms, came to Nantucket from the mainland. 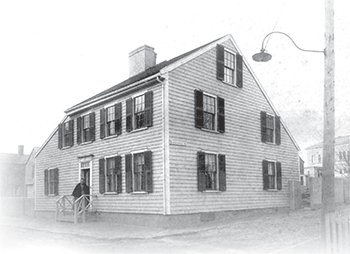 The form was so popular that by the first decade of the 1700s most houses on Nantucket were constructed with lean-tos incorporated into the original design. The addition of a lean-to or the construction of a house with a lean-to incorporated into the original design (known as the integral lean-to house) occurred because it made sense. The lean-to house provided additional rooms on the first floor, including a keeping room (kitchen) that left the hall and parlor available for other uses besides cooking. Like other early houses, lean-tos were built facing south, thereby providing protection or insulation for the main section’s north side. Early builders knew that placing the lean-to’s long sloping roof to the north helped to direct wind up and over the structure. Clay Lancaster in The Architecture of Historic Nantucket notes that of the forty integral lean-to houses extant about twothirds face southward. Some of those not oriented southward were moved from their original sites. This functional form remained in favor with Nantucketers for many years. The construction of integral lean-to houses continued into the mid-eighteenth century, and it was not until the introduction and acceptance of the typical Nantucket house (see Ramblings, Vol. 4) that the form fell out of fashion. Even so, the lean-to was not abandoned but incorporated into the design of houses including the smaller lean-to (1 ¾ stories high) built from the late eighteenth century and into the first quarter of the nineteenth century. The early integral lean-to houses generally fall into two categories: the three-bay-wide half house and the full house (either three or five bays wide). Both versions employed heavy timber frames. Common interior features included a porch (entry way) with winder staircase and lower closet directly ahead against the massive chimney, exposed corner posts, low ceilings, and summer beams (often with chamfered, or angled, edges); paneled fireplace walls, mirror boards, and plank cradle boards. Of the two versions, half houses were the more common and were built for possible future expansion. The half house usually had a chimney on the roof ridge at the end nearer the front door. The chimney could be easily added to with the expansion of a shed-roof lean-to addition or a similar sized two-story wing. These lean-to forms appear to be the first house forms on Nantucket that were originally shingled, although it is possible the earliest versions had plank board exteriors, but examples no longer exist. Like their predecessor (the Medieval or English house) lean-to houses often have articulated brick chimneys. The earliest examples had casement windows, but all surviving forms have sash windows. In most instances, windows are asymmetrically placed, and those on the south elevation were usually larger to capture solar heat—often with twelve over-twelve lights while nine-over-nine light windows are found on the upper floor and elsewhere on the building. Because the lean-to is one of the earliest house forms, identifying them can be difficult since most examples have undergone alterations over the years. These houses were also moved, and their lean-to sections often were raised, making their rear elevations a full two stories high. Hence, many houses with lean-to beginnings hold a wealth of layers ripe for uncovering by the curious owner, architectural preservationist, or traditional building contractor. Today, the lean-to form can be easily adapted for modern living, and those that retain evidences of their original interior features are treasured and are unfortunately increasingly rare. Fewer than fifty true lean-to houses remain, and many of them have undergone major changes that have destroyed much of their historic integrity. The historic significance of a building does not stop at the exterior. The interior matters, too. The plan of a house, its features and materials, all reflect its history and evolution and contribute to its historic character. On Nantucket, where only the exterior is regulated, what’s inside is frequently overlooked. An important part of the NPT mission is to demonstrate what is possible. Properly preserved and maintained interiors not only have historic significance, they are valuable as real estate assets. Preserving interior features of a historic house makes sense financially and is essential for the edification of future generations. The original floor plan is essential to defining historic character. Parlors, hallways, and staircases all contribute to the character of the building and should be retained in a preservation project. In some cases, changes in floor plans are necessary. The appropriateness of interior changes can be analyzed by using a hierarchical approach that “ranks” the significance of spaces in a building. In residential buildings, there are usually “private” and “public” spaces, reflecting the need for formal functional areas and private individual living spaces. For example, stair halls and parlors are often on the main floor, while bedrooms, closets, and service areas are on upper floors or in rear areas. If changes are desired, character-defining “public” areas should be retained; and the proposed use, program, and plan should not alter those primary historic spaces. Features and materials such as woodwork, doors, and mantels should be treated carefully even in the areas of secondary significance. New baths, closets, and kitchens, for example, might appropriately be placed in ells that have been added to the historic structure or in a new wing. Floor plans are only part of the historic interior’s character. Wall, ceiling, and floor treatments; doors and door and window trim; fireplaces and their mantels; and other finishes are all important features. 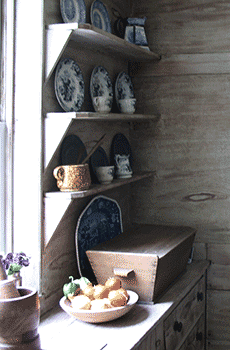 Interiors often exhibit a mix of historic styles that reflect changes in use and taste. An early twentieth-century interior that has been placed in a nineteenth-century building, for example, is part of the building’s history and might be worthy of preservation. All sound interior features should be retained and repaired. If damaged or deteriorated beyond repair, they should be replaced in-kind. Ceiling height, another important interior feature, helps convey historic character because it defines spatial volume, proportion, and light. Historic building rehabilitation often requires new construction and limited amounts of demolition. This work should take place at secondary or nonsignificant spaces to minimize impacts to the historic resource. the historic in scale, material, and general profile, rather than replicating historic woodwork. Demolition should always be kept to a minimum, and limited to secondary spaces or areas of extreme deterioration. Because demolition can involve the removal of historic material, it should be planned to have the least possible impact on the historic building. Routine maintenance is a key to preserving interior historic materials; it prevents small problems from becoming large ones. Keeping up with maintenance will preserve your house for many years to come. The Nantucket Historical Association’s 1800 House located at 4 Mill Street will be the 16th property on island permanently protected by a NPT preservation easement. The preservation restriction will be up for a vote at the Board of Selectmen’s meeting on November 16. The easement will be placed on exterior features and restricts further development of the property. Historic research indicates the house was constructed between 1801 and 1807 by housewright Richard Lake Coleman, who built the structure according to a traditional floor plan and scale characteristic of New England domestic architecture of the period. 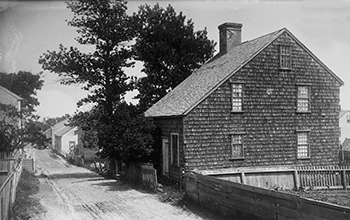 In 1807 Coleman sold the house to Jeremiah Lawrence, “hatter” and High Sheriff of the County of Nantucket, who occupied the house with his wife and four children until his death in 1827. It remained in the Lawrence family until 1859. The long awaited update to the Nantucket Historic District Landmark designation was unanimously approved on November 10 by the National Park System Advisory Board Landmarks Committee in Washington, D.C. The report, prepared by the Nantucket Preservation Trust with funds from the Community Preservation Committee, began in 2007. The three year plus study includes a comprehensive analysis of the island’s architectural heritage and area of national significance. With this important hurdle now complete the update will proceed to the National Park Service for final revisions and formal approved by the Secretary of the Interior–expected in 2012. Although the old historic core and Sconset were recognized as a National Landmarks as early as 1966, when the program was first implemented by the Federal government, and landmark status was updated in 1975 to include the entire island, the designation did not recognize a significant part of the island’s history, namely its development in the late 19th and early 20th century as a resort community and the island’s critical role in the country’s preservation movement. With the acceptance of the update, these key elements of the island’s historic significance will be formally recognized. National Historic Landmarks are nationally significant historic places designated by the Secretary of the Interior because they possess exceptional value or quality in illustrating or interpreting the heritage of the United States. Today, fewer than 2,500 historic places bear this national distinction. The majority of NHL properties are individual buildings or resources. Nantucket is one of only a handful of communities which is entirely a NHL district. The program is the highest honor for historic properties and communities in the nation, and is meant to encourage and promote preservation activity. NHL designation has also been shown to help increased tourism and Main Street revitalization. Other benefits include qualification for historic properties in grant and tax credit programs, preservation easements programs, and release of building code requirements that can have a negative impact on historic fabric.